Today, Congressman Jerrold Nadler, senior Member of the House Transportation and Infrastructure Committee, questioned Pete Lopez, Administrator for Region 2 of the Environmental Protection Agency (EPA), during a hearing into the federal response to the 2017 hurricane season. 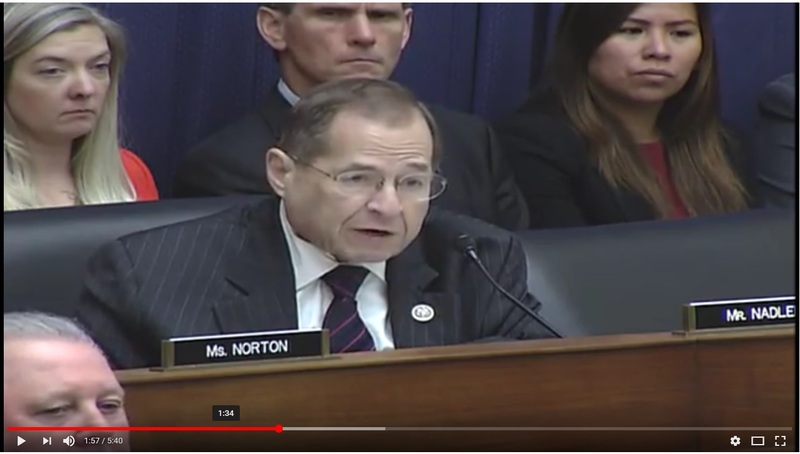 Congressman Nadler asked Mr. Lopez about the EPA’s response in Puerto Rico, including the agency’s actions at the Dorado Superfund site where there have been reports of people drinking contaminated water. Congressman Nadler expressed his concerns that the EPA was committing the same mistakes after 9/11 when it declared the environment was safe and thousands of New Yorkers got sick as a result. "Mr. Lopez, I hope you can finally clear up some confusion related to news reports of people drinking water from wells on the Dorado Groundwater Contamination Superfund site, in Dorado, Puerto Rico. "That is troubling, because it adds to the confusion, secrecy, and distrust of government sources in protecting public health and the environment. So, I have some specific questions related to the Dorado Superfund site, and EPA actions to protect human health from known contaminants on that site." 1) The Dorado Superfund site was listed to the National Priorities List just last year, correct? 2) This Superfund site consists of a ground water plume of industrial chemicals and solvents, including TCE, PCE, chloroform, and other chemicals known to have adverse human health effects – both short term and long term, correct? 3) It is my understanding that two wells on the Dorado Superfund site, the Nevarez and Santa Rosa well sites, still have active wells in operation – some of which the press has reported were used as a source of drinking water following Hurricane Maria. Is that correct? 4) Has EPA investigated whether any other well on the Dorado site was used as a source of drinking water since Hurricane Maria? 5) It is also my understanding that, when the Dorado Superfund site was listed on the NPL, sampling at the Nevarez and Santa Rosa sites both found traces of these industrial chemicals, including chloroform, DCE, TCE, and PCE. Is that correct? 6) The Wednesday news report quotes an EPA spokesperson as saying that water being pulled from the Dorado Superfund site “meets federal drinking water standards”. Is that based on EPA testing since the landfall of Hurricane Maria? 7) Has EPA made all of the drinking water sampling data publicly available? If not, why not? Will you commit to this Committee to make all of this sampling data immediately available to the public? 8) The press also reports that, in 2016, when the Dorado Superfund site was initially listed on the Superfund National Priorities List, that EPA stated, “Drinking water with the solvents, which include tetrachloroethylene and trichloroethylene, can have serious health impacts including damage to the liver and increasing the risk of cancer." Now, EPA is saying that the water is safe to consume. Why the change in positon in just one year? 9) Is there any scientific dispute as to what drinking water tolerable levels are? "I just have to say that I am greatly concerned about EPA’s response to Hurricane Maria. It is eerily similar to EPA’s response after 9/11 at the World Trade Center in NY when EPA infamously and incorrectly declared the air is safe to breath and the water is safe to drink. Thousands of people became sick due to the federal government’s negligence. We cannot let the same thing happen to the people of Puerto Rico (or Texas or Florida for that matter). "I would urge you to protect people from these sites and ensure they have clean drinking water, do comprehensive testing for all chemicals present, and make that testing data public immediately."